YoYoExpert Blog & Yo-Yo News – New Duncan Pulse Yo-Yo, Candy Dice, & Patches! 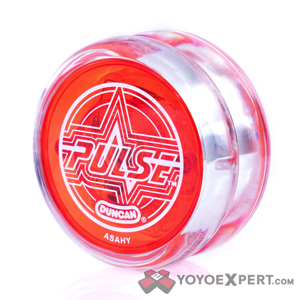 The newly redesigned Duncan Pulse is one of our favorite light up yo-yos! It lights up bright, has great balance, and it’s extremely affordable! Color changing lights and blinking patterns vary with each second of increased spin time to give the Pulse a really dynamic look in play. The redesigned shape offers improved looping performance and the ball bearing offers plenty of spin time. The Pulse takes a standard 2-handed performance and transforms it into a fantastic show of light and color! Turn the lights off and get ready to turn some heads with the light up Pulse! 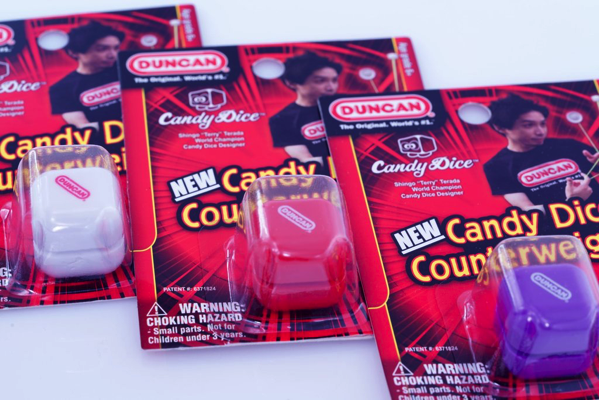 Candy Dice are a brand new Duncan Counterweight designed by World Yo-Yo Champion Shingo Terrada! These unique counterweights are solid with a string groove around the cube. You don’t have to thread your string through, just take it off your finger, loop it around the counterweight, and you’re ready to play 5A! Show your love for one of your favorite yo-yo companies with this cool new iron on Duncan logo patch! Perfect for backpacks, hats, yo-yo bags, or even shirts. Iron it on with ease and throw your favorite Duncan yo-yo in style!